No, Donnie Darko simply works because it's completely original even with its sci-fi undertones. Its portrayal of late-1980s suburban American disquiet and crippling teenage perplexity is so authentic that a talking six-foot tall metal-faced rabbit named Frank is rendered only slightly less than completely plausible. 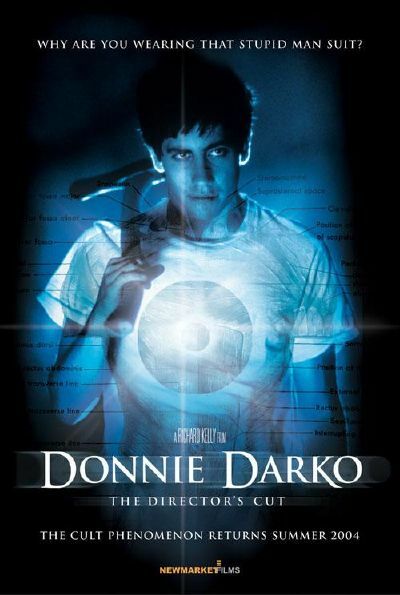 Donnie Darko succeeds because of first-time writer/director Richard Kelly’s (who went to make the equally surreal Southland Tales) complex script, which - at once candidly determined, mournfully delicate and strikingly intelligent - is also wise enough to make Donnie's parents caring and insightful, knowing that need not preclude the troubled kid from hating them. It works because Jake Gyllenhaal (in one of his best performance since October Sky and Bubble Boy) brings a restrained, tormented charm to the primary character of Donnie. And not to mention and this is the aspect that will haunt you afterwards - the stellar music of Michael Andrews and the befitting 80’s new wave soundtrack including "Mad World", the haunting No.1 Gary Jules piano-driven cover hit of the Tears for Fears single. By portraying so honestly the time in which it’s set, Donnie Darko captures a dreamlike world of feeling and detail that transcends time, which is what the movie is all about in the first place. Or is it? Present below are Video links to the original version and the extended Director's Cut which was released in 2004.
awesome movie. awesome review. awesome blog.